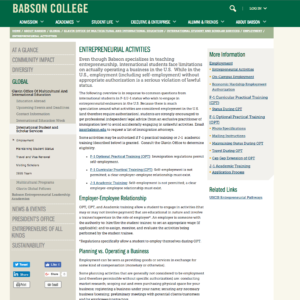 Babson College, a leader in assisting international entrepreneurs, has published this very useful guide on their website. It helps F-1 & J-1 visa holders understand what types of entrepreneurial activities they can perform while in the US on a student visa. This entry was posted in Employment Issues and tagged Babson College, F-1 visas, J-1 Visas, Unauthorized Employment. Bookmark the permalink.